Two hours from New York in Pennsylvania, USA; our junior endurance squads continued their fine run of form with quality performances and results on both the road and track this week. On Sunday (NZ Time), both the men’s and women’s age-group teams competed amongst pro-level fields at the Grandview Criterium in Lancaster, and grabbed five of a possible six podium places, including victory in both categories. Central Otago’s Sophie Williamson (pictured above in blue) and Cassie Cameron from Wanganui made an early break from the chasing pack and stayed ahead to claim first and second in the women’s 40km race. Georgina Wilson from Auckland won the bunch sprint for third to complete an all-Kiwi podium. In the 56km men’s event, it was Te Awamutu’s Hayden McCormick who broke free from a field of 51 riders to ride over the line solo, earning top spot on the podium. Liam Aitcheson from Central Otago edged the bunch sprint to get second, while Tayla Harrison from Christchurch rode to a solid eighth place finish. There wasn’t much time for the team to celebrate, however, as just three days later they traded their road bikes for track bikes to assert their current dominance of the Pennsylvanian cycling scene in the Fuji Bicycles Pro-Am Series at the local velodrome. The crowd and the commentator quickly learned who Dylan Kennett from Waimate was when he won the opening elite men’s event of the night, before following it up with two more race wins throughout the evening. The New Zealand team had a successful outing all round; the most notable performer for the women’s team was Williamson who earned three different second place finishes. The team has one more race meeting this weekend (NZ Time) before heading home for their final preparations before the Junior Track World Championships. Meanwhile, the New Zealand junior sprint squad are coming to the end of a two-week training camp in Queensland, AUS; as they too prepare for Invercargill next month. Sprint coach John Rastrick said the key focus of the trip was to get the riders mentally prepared for the world-stage, but also to increase the intensity in the legs with physical strength and power training sessions. Despite the fact there was no formal racing scheduled for the excursion, Rastrick said it was a worthwhile experience to train in an ideal climate for sprinters, on a quality 333m concrete velodrome in Rockhampton. “The team has been working very hard throughout a cold New Zealand winter and into Australia. I am happy with their overall preparation at this stage,” he said. 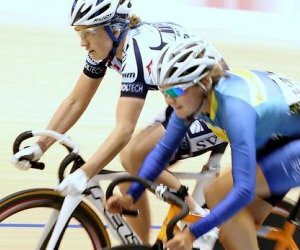 The Junior Track World Championships will take place at the ILT velodrome in Southland on August 22-26. New Zealand is hosting at least 20 foreign teams, in what will truly be world-class cycling event. For more information, visit www.juniorworlds2012.com.